Is Sheikh Hasina turning Bangladesh into a one-party state? Dhaka, Apr 5 (Just News): The controversial jailing of former Bangladesh Prime Minister Begum Khaleda Zia and the state persecution of dissent have raised fears that the next parliamentary election could turn into a violent sham. Fear of a 2014 repeat, when the parliamentary elections were boycotted by almost all the opposition parties and marred by large-scale violence and killings, runs high in Bangladesh as the ruling Awami League (AL) government faces allegations of a concerted persecution of its opponents. While activists and political workers opposed to the government live under an increasing threat of being jailed or worse, there is widespread concern, even among the common people, over what lies ahead in an election year. Parliamentary elections in Bangladesh are due by December. Nadia Tabassum Khan, an employee of a multinational company in Dhaka, told Al Jazeera that the Awami League has suppressed all dissent to such an extent that she doesn't think "anyone would dare to protest against them". Hasan Habib is the owner of a real estate company based in Dhaka. He says "the enmities between the two leading political parties" have made the voting process "a nearly impossible task". Since the controversial imprisonment of Bangladesh's opposition leader and two-time Prime Minister Khaleda Zia last month, it is becoming increasingly difficult for the government of Prime Minister Sheikh Hasina to reject allegations of turning into an authoritarian regime. Zia was sentenced to rigorous imprisonment for five years on February 8 for embezzling 21 million takas ($253,000) in foreign donations meant for a charity named after former President Ziaur Rahman, Zia's husband. Her elder son and heir apparent, Tarique Rahman, and four others were also sentenced to 10 years in prison. Nearly a month later Zia was granted bail. However, the country's Supreme Court stayed the bail within a week "without assigning any reason", effectively putting the 72-year-old leader in jail till May 8, when the next hearing on her bail application is expected to be held. The arrest and subsequent imprisonment of the former prime minister, which Zia's Bangladesh Nationalist Party (BNP) called the Hasina government's conspiracy to keep the opposition party out of politics, led to widespread violence in cities across Bangladesh, with BNP supporters clashing with police and ruling party members. Police records say nearly 300 leaders and supporters of the BNP were arrested on the day of Zia's verdict. Since February this year, over 3,000 members of the opposition party have been put behind bars. Hasina and Zia - both women are related to former Bangladesh leaders - have dominated the country's politics for more than two decades. In fact, the bitter rivalry between the country's most powerful "begums" has pushed Bangladesh in the grip of violence and unrest for years. The BNP alleges that over 500 of its supporters have been killed and nearly 750 "abducted" by the police and thrown in various jails since 2014. The party claims around 150 more of its missing workers have either been killed in extrajudicial encounters or have been forced to disappear. The main opposition party says it has not yet decided on a plan of action following the Zia verdict. The party has largely resorted to non-violent protests against the crackdown on it. However, as permissions for political rallies are denied, many in the BNP are losing patience with the strategy of holding peaceful protests. The spectre of large-scale violence now threatens to destabilise the parliamentary elections in the country scheduled to be held in December this year. Last week, German think-tank Bertelsmann Foundation released a report that said the country is now under an autocratic rule. Listing 13 countries "where the political situation has become significantly worse", the report said in five of these countries, namely Bangladesh, Lebanon, Mozambique, Nicaragua and Uganda, "democracy has been gradually undermined for years" and that they no longer meet its minimum standards. Political commentators in and outside Bangladesh concur with such a damning reading of the Hasina government, especially in the context of the state conducting free and fair elections. In 2014, Hasina had returned to power for a second consecutive term through a controversial and bloody national election, which was boycotted by the centre-right BNP. In her 10-year tenure as the prime minister of Bangladesh, Hasina has been accused of using the state's law enforcement apparatus as well as the judiciary to suppress the voice of the opposition. Rights groups, both local and international, have reported a deteriorating human rights situation in Bangladesh in recent years. Bangladesh rights group Ain o Salish Kendra (ASK) says as many as 519 people have allegedly fallen victim to enforced disappearances since 2010 while over 300 people are still missing. "My father has been missing since December 4," said Shabnam Zaman, daughter of former Bangladesh ambassador to Qatar and Vietnam, Maroof Zaman, who was accused of sharing "anti-government posts" on social media and was allegedly scooped up by unidentified abductors in Dhaka in December last year. "The police stopped their investigation when they came to know about the circumstances surrounding the disappearance of my father," she told Al Jazeera. On March 13 this year, Jakir Hossain, a leader of Chatra Dal, which is the BNP's student wing, died in police custody after he was allegedly tortured by the police. A Human Rights Watch (HRW) report last year said the Bangladesh government had secretly arrested hundreds of people, mostly activists and political figures, opposed to the Hasina government. The Awami League government, however, dismissed the allegations. When Al Jazeera asked Information Minister Hasanul Haq Inu about the political persecution as alleged by the BNP, he said the opposition party enjoys "complete freedom" in its exercise of the democratic rights. "But that doesn't mean the law enforcers will not check their activities which may harm the common people," Inu said. When reminded of the controversial 2014 national election, which the BNP had boycotted and which has renewed fears of a similar undermining of the electoral process in Bangladesh, Inu said; "The 2014 election was held as per the constitution. The BNP's decision of boycotting it was a political decision and they now realise it was a wrong decision on their part." The Bangladesh minister also rejected the German think-tank report that called the AL government autocratic as "intentional" and "baseless". He said he was eager to know what data Bertelsmann Stiftung had looked at. 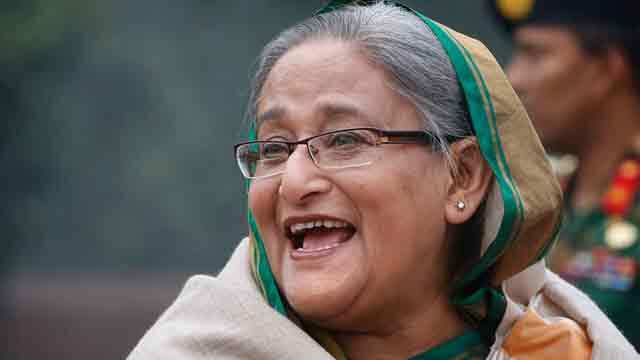 "All the arms of a true democracy, including the judiciary and media, are fully independent in Bangladesh," Inu said. Senior Awami League leader Faruq Khan told Al Jazeera the rights groups' accusation of human rights violation in Bangladesh is not true. "Our government has, in fact, set up an example before the world of upholding human rights by giving refuge to a million Rohingya refugees who have fled Myanmar," Khan said. But the experts and rights activists are not buying the government's defence. Meenakshi Ganguly, who is the South Asia Director of Human Rights Watch, says Bangladesh may have won international praise for its humanitarian response to the ethnic cleansing of the Rohingya by Myanmar but the domestic human rights situation remains a cause for concern. "The government continues to deny enforced disappearances … It must release individuals taken into custody by the security forces. Many of those disappeared are linked to the political opposition," Ganguly told Al Jazeera. Ganguly said Bangladeshi journalists and activists operate in a climate of fear, while many citizens have been slapped with cases for criticising the government on social media. Ali Riaz from the Illinois State University in the United States told Al Jazeera that the current political and human rights situation in Bangladesh is "not suitable" for holding an election, let alone an "inclusive" one. Riaz thinks if the beleaguered BNP is forced to boycott the next national election, along with other parties of the political alliance it leads, the election will be "hollow without any moral legitimacy, just like the 2014 elections". "Continued persecution of the opposition is not only unwise, but also counterproductive. There is a tendency among the ruling parties here to forget that," said Riaz. Asif Nazrul, a professor of law at Dhaka University, said that the government denies the BNP and other opposition parties permission to hold rallies and processions "on security grounds", while it continues to hold large rallies in the run-up to the elections.